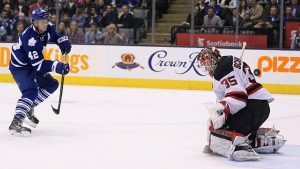 The Toronto Maple Leafs were unable to continue their winning streak when they lost to the Washington Capitals 5-6 on Tuesday. The game was not only a high scoring but also a high intensity match that kept everyone on the edge of their seats. The Devils on the other hand got their much-needed win on Tuesday by defeating the Carolina Hurricanes by 3-1, prior to this game the Devils were in a terrible slump having lost 10 out of 13 games. It remains to be seen if they can continue their winning streak. The puck will drop at 7:30 pm ET on Friday at the Prudential Center in Newark, NJ, where these two teams will face after a couple of days of much needed rest. The Toronto Maple Leafs have played a total of 37 games this season, and currently hold the 10th spot in the NHL Eastern Conference with a record of 17-12-8, the New Jersey Devils have played 39 games and are currently the number 13th seed in the same conference with a record of 16-16-7. This match is closer than it would seem, if we consider that the Devils have 2 more games than Toronto, and it will be interesting to see who will commence a positive streak and who will continue to spiral downward. The Devils are averaging 2.2 goals per game going into this game, and are scoring on 14.1 percent of their power play opportunities. The players who are carrying their offense are lead scorer Pierre-Alexandre Parenteau who has 11 goals on record, Adam Henrique with 10 goals and 11 assists, Michael Cammalleri with 79 shots on goal and a shot percentage of 12.7%. The New Jersey Devils defense could be tighter, as they are allowing 3 goals on average per game, but, they are killing close to 83 percent of their opponent’s power plays. It has not been announced who the goalie for this game will be; Cory Schneider has allowed 80 goals on 791 shots during his 29 starts, giving him a save percentage of 0.908. Keith Kinkaid has allowed 29 goals on 324 shots over 10 games making his save percentage 0.918. The Toronto Maple Leafs offense is averaging 3 goals per game and are scoring on 19.6% of their power play opportunities. Their biggest offensive threats are Auston Matthews who leads the team with 20 goals, 14 assists and 134 shots, while Mitchell Marner has 19 assists, 10 goals and 103 shots, meanwhile Nazem Kadri has 14 goals, 8 assists and 117 shots on goal. Defensively, the Toronto Maple Leafs are allowing close to 3 goals per game on average, but have managed to kill about 85% of their opponent’s power plays. Lead goalie Frederik Andersen who has played 1,850 minutes this season, has allowed 81 goals on 930 shots, making his save percentage 0.920. There is no doubt that Toronto is the team to beat here, but the one thing that might help the Devils is their home record of 10-4-2 against the Maple Leafs away record of 7-6-6. For the Devils to win, they need to contain the Maple Leafs to less than 1 goal as they can’t seem to win a game when allowing more than that, but considering how strong the Toronto offense is this will be very difficult to achieve. Make sure to check out the early NHL odds at Ace Sportsbook.